Well+Good Council member Candice Kumai is the author of six books, including her latest, Kintsugi Wellness, which gives life lessons on how to cultivate inner strength and live a gracious life, through different Japanese traditions—and includes lots of yummy recipes. Here, she shares one of her faves. Maybe you whip up a stack for your S.O., surprising him or her with breakfast in bed on Valentine’s Day morning. Or maybe you keep the lovefest going through the weekend and make them together for brunch on Saturday or Sunday. Or maybe you want to show love to your mom, best friend, or group of girlfriends, inviting them over for weekend brunch. 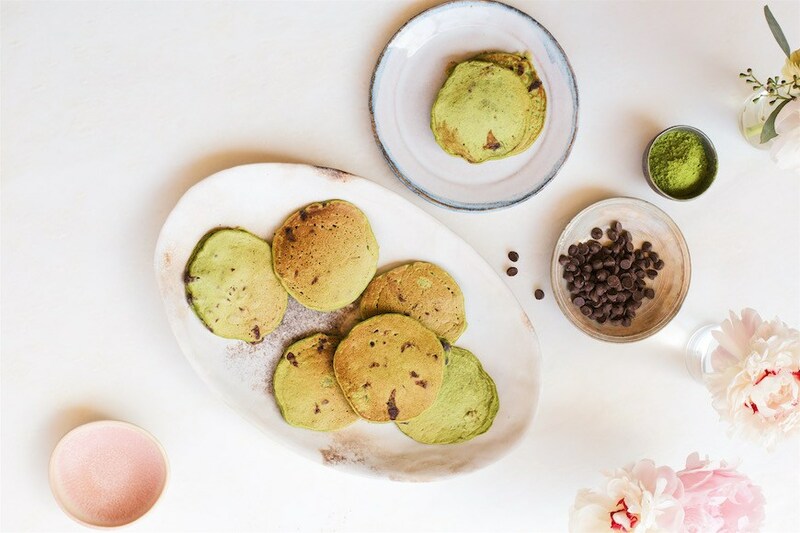 Whoever you decide to make these very special pancakes for, they are sure to provide an energizing start to the day thanks to the not-so secret ingredient: matcha, which is what I rely on to power my day in place of coffee. (BTW, if you’re still looking for a V-Day gift, check out The Matcha Shoppe.) That, and of course really wholesome, nourishing ingredients. And fortunately, this recipe has both. 1. Whisk the flour, matcha, and baking soda together in a large bowl. Set the dry ingredients aside. 2. In a separate medium bowl, whisk together the eggs (if using), brown rice syrup, banana, vanilla, and almond milk. Add the wet ingredients to the dry ingredients and gently whisk to combine. Using a rubber spatula, fold in the chocolate chips; the batter will be thick. 3. Heat a large nonstick skillet over medium heat. Coat the pan or griddle top with nonstick cooking spray. 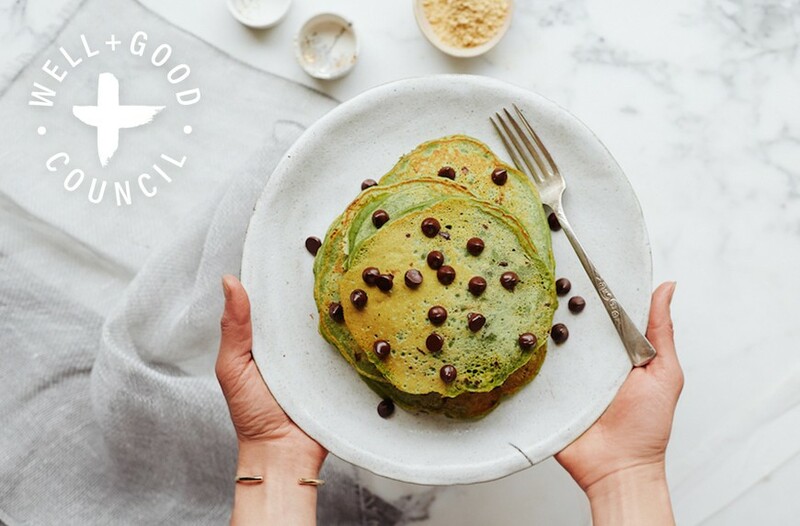 Using 1/4 cup of batter for each pancake and cooking two to three pancakes at a time, pour the batter into the pan or onto the griddle, using a measuring cup or ladle. 4. Cook the pancakes until the outer edges firm up and the bottom is golden-brown, about two minutes. Flip and cook the other side until golden-brown, about two minutes more. Repeat, making pancakes with remaining batter. If you’re on the hunt for the perfect Valentine’s Day date idea, check out these creative ways to bond. And here’s what to give yourself this V-Day.